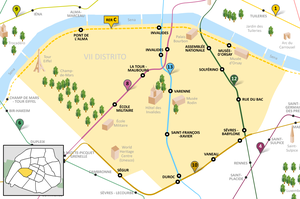 The 7th arrondissement of Paris (VIIe arrondissement) is one of the 20 arrondissements of the capital city of France. In spoken French, this arrondissement is referred to as septième. View of the Eiffel Tower and the Invalides. The arrondissement, called Palais-Bourbon, includes some of the major and well-known tourist attractions of Paris, such as the Eiffel Tower, the Hôtel des Invalides (Napoleon's resting place), the Chapel of Our Lady of the Miraculous Medal, and a concentration of such world-famous museums as the Musée d'Orsay, Musée Rodin, and the Musée du quai Branly. Situated on the Rive Gauche—the "Left" bank of the River Seine—this central arrondissement, which includes the historical aristocratic neighbourhood of Faubourg Saint-Germain, contains a number of French national institutions, among them the French National Assembly and numerous government ministries. It is also home to many foreign diplomatic embassies, some of them occupying outstanding Hôtels particuliers. The arrondissement has been home to the French upper class since the 17th century, when it became the new residence of French highest nobility. The district has been so fashionable within the French aristocracy that the phrase le Faubourg—referring to the ancient name of the current 7th arrondissement—has been used to describe French nobility ever since. The 7th arrondissement of Paris and Neuilly-sur-Seine form the most affluent and prestigious residential area in France. Construction of Hôtel de Salm, 1787. Paris, Musée Carnavalet. During the 17th century, French high nobility started to move from the central Marais, the then-aristocratic district of Paris where nobles used to build their urban mansions (see Hotel de Soubise), to the clearer, less populated and less polluted Faubourg Saint-Germain. The district became so fashionable within the French aristocracy that the phrase le Faubourg has been used to describe French nobility ever since. The oldest and most prestigious families of the French nobility built outstanding residences in the area, such as the Hôtel Matignon, the Hôtel de Salm, and the Hôtel Biron. After the Revolution many of these mansions, offering magnificent inner spaces, many reception rooms and exquisite decoration, were confiscated and turned into national institutions. The French expression "les ors de la Republique" (literally "the golds of the Republic"), referring to the luxurious environment of the national palaces (outstanding official residences and priceless works of art), comes from that time. During the Restauration, the Faubourg recovered its past glory as the most exclusive high nobility district of Paris and was the political heart of the country, home to the Ultra Party. After the Fall of Charles X, the district lost most of its political influence but remained the center of the French upper class' social life. During the 19th century, the arrondissement hosted no fewer than five Universal Exhibitions (1855, 1867, 1878, 1889, 1900) that have immensely impacted its cityscape. The Eiffel Tower and the Orsay building were built for these Exhibitions (respectively in 1889 and 1900). The land area of the arrondissement is 4.088 km² (1.578 sq. miles, or 1,010 acres). The 7th arrondissement attained its peak population in 1926 when it had 110,684 inhabitants. Because it is the location of so many French government bodies, this arrondissement has never been as densely populated as some of the others. In 1999, the population was 56,985, while the arrondissement provided 76,212 jobs. Hôtel de Boisgelin (Rue de Varenne, Paris), historic building, home to the Italian embassy in Paris. Air Liquide, Alcatel-Lucent, and Valode & Pistre have their head offices in this arrondissement. Istituto Statale Italiano Leonardo Da Vinci, an Italian international school, maintains two campuses in the arrondissement. The American University of Paris, a private liberal arts university, maintains several buildings near the Quai d'Orsay. The Ministry of Agriculture, the Ministry of Foreign Affairs and the Ministry of National Education have their head offices in the arrondissement. The arrondissement hosted the equestrian events for the 1900 Summer Olympics. ^ "Chapel of our Lady of the Miraculous Medal". Paris Digest. 2018. Retrieved 2018-11-21. ^ Drouin, Olivier (2013-08-22). "Les 80 communes où se concentrent les plus hauts revenus". Capital.fr (in French). Retrieved 2016-04-19. ^ "Legal notice." Air Liquide. Retrieved on 7 July 2010. ^ "Alcatel-Lucent Fact Sheet Archived 2010-08-29 at the Wayback Machine Retrieved on 17 August 2011 "Headquarters 3 av. Octave Gréard 75007 Paris, France"
^ "University History | The American University of Paris". www.aup.edu. Archived from the original on 2016-03-04. Retrieved 2016-06-29. ^ "Mentions légales." Ministry of Agriculture. 8 June 2007. Retrieved on 6 May 2011. "Ministère de l’Agriculture, de l’Alimentation, de la Pêche, de la Ruralité et de l’Aménagement du territoire 78, rue de Varenne - 75349 Paris 07 SP"
Wikimedia Commons has media related to Paris 7e arrondissement.